신라 지마왕(112∼134)의 무덤으로 23년간 재위하면서 가야, 왜구, 말갈의 침입을 막았다. 성은 박씨로서 파사왕의 아들이다. 무덤의 모양은 비교적 규모가 큰 둥근무덤으로 남산에 뻗은 경사면의 높은 곳에 만들었으며 별다른 특징은 없다. 무덤의 위치와 규모 및 형태로 보아 신라 초기에 만든 것으로 볼 수는 없다. 무덤 앞에 최근에 설치한 작은 석상이 놓여있다. 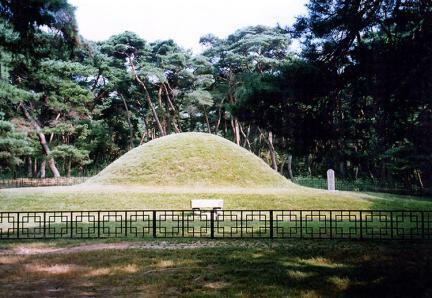 This is the tomb of King Jima (A.D. 112~134) of the Silla Dynasty, who saved his country from the attacks of foreign nations such as Gaya, Japan, and the Malgal. He was the son of King Pasa of Park Clan. His tomb is relatively large, and circular in shape. 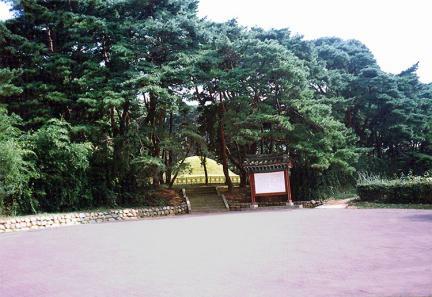 It is located on Namsan Mountain at an especially high spot, but it has no particularly original features of its own. Its location, size and shape suggest that it was not constructed early in the Silla period. A small stone structure resembling a stone tablet was recently placed in front of the tomb.